This road is a great driving and hiking day-trip starting in Bucharest, Brasov or Sinaia and it can also be included in a multi-day Bucharest, Valea Prahovei and Southern Transylvania itinerary. The TransBucegi – also called Drumul Babelor (the road to the Old Dames) - ranges in elevation from 2,495 feet at Sinaia to almost 6,316 feet at Bucegi National Park. 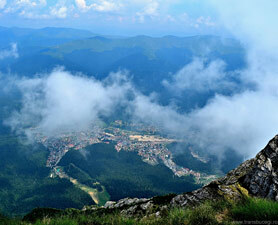 The Bucegi Mountains Plateau is also accessible – without a car - from the town of Busteni (4 miles north of Sinaia). One can hike the mountain from the resort town of Bușteni, through meandering paths among stunning views, or simply take the cable car (telecabina) up to the top. Most hiking paths that start up in Bucegi Plateau do not require extreme fitness or determination. Points of note: Sinaia, Peles Castle, Bucegi Nature Park, Padina, Pestera (acces by cable-car or hiking), hiking trails to: "The Old Dames" (Babele) and the "Sphinx" (Sfinxul) rock formations, Caraiman Heroes Monument, peaks Costila (8,173 ft.) and Omu(8,229 ft.).